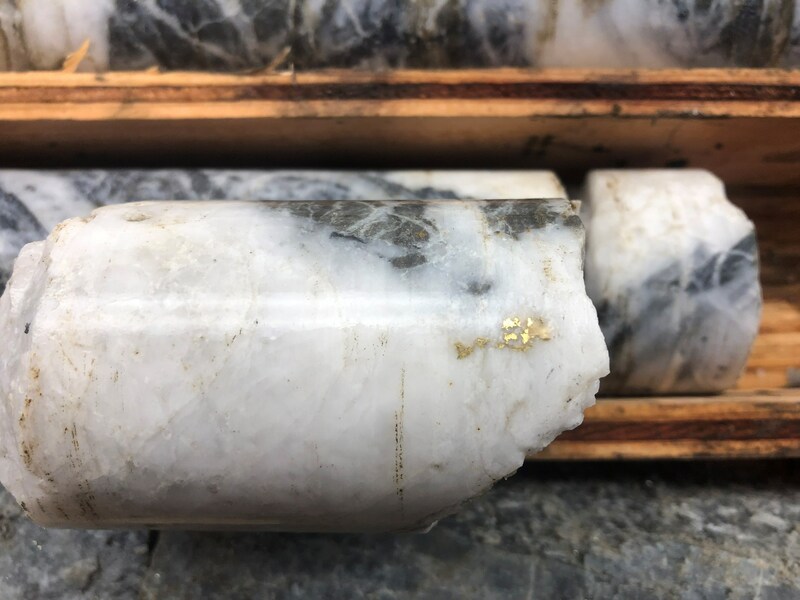 Vancouver, British Columbia--(Newsfile Corp. - March 19, 2019) - Rise Gold Corp. (CSE: RISE) (OTCQB: RYES) (the "Company") is pleased to announce additional assay results from on-going diamond core drilling at the Idaho-Maryland ("I-M") Gold Project. The exploration drill program at the Idaho-Maryland continues to be successful. Recent drilling intersected the Idaho #1 Vein below historic mining areas and intersected the 52 Vein area prior to reaching the Idaho #1 Vein target. A shallow vein was also intersected at 259 m.
*The Company is not able to estimate true widths for the intersected mineralization until further drilling is completed. Very high-grade gold mineralization was encountered in drill hole I-19-13A which assayed 90.4 gpt gold over 4.27 m (2.6 oz per ton / 14 feet). Rise Gold has interpreted this intercept to represent a significant down-dip extension of the historic Idaho #1 Vein. The intercept in I-19-13A is near the elevation of the lowest haulage level of the mine accessed by the existing vertical mine shaft. The Idaho #1 Vein was the most productive and highest-grade vein of the I-M Mine. Historic production from the Idaho #1 Vein is estimated at 935,000 oz of gold with an average head grade of 38.7 gpt (1.12 opt) gold. Total historic production from the Idaho Veins is estimated at 1,621,000 oz of gold with an average head grade of 28.4 gpt (0.74 opt) gold. The mineralized intercepts in drill holes I-19-13 and I-19-13A consist of a quartz shear vein and extensive zones of quartz-sericite-pyrite alteration in the walls of the vein. Drill hole I-18-11 intersected the Idaho #1 Vein approx. 525 m along strike to the north-west and 200 m below I-19-13A. The intercept consists of a quartz shear vein and extensive zones of quartz-sericite-pyrite alteration in the walls of the vein. Drill hole I-18-13A and I-18-11 are located 120 m and 320 m vertically below the I2400 level, the lowest level of exploration on the Idaho #1 Vein. Historic drifts were driven from each end of the vein and reported to be in gold mineralization at the time the mine was shut down. Drill hole I-18-12 was designed to test the down-dip extension of the mineralization encountered in I-18-11 but significantly deviated and did not reach the intended Idaho #1 Vein target. Rise Gold is currently drilling the Idaho #1 Vein target between I-19-13A and I-18-11 and utilizing directional drilling to improve the accuracy of drilling and expedite the next intercepts. 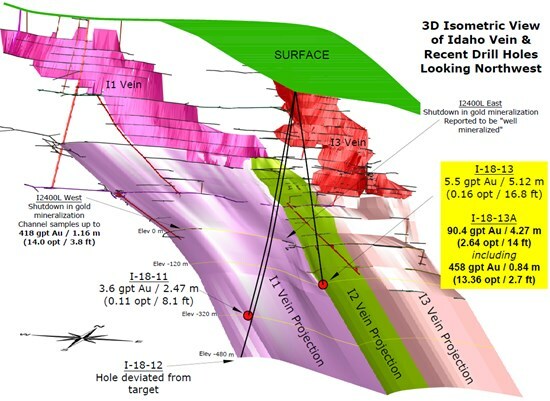 A summary of drill hole assay results from recent exploration diamond drilling on the Idaho #1 Vein target are presented in Table 1 and illustrated in Figure 2. A photo of coarse visible gold in drill hole I-19-13A is displayed in Figure 1. The Isometric drawing (Figure 2) showing the recent drill hole intercepts in the Idaho area can be downloaded from the following link. Drill holes I-18-11 and I-18-12 drilled though the 52 Vein area en route to the Idaho #1 Vein target. 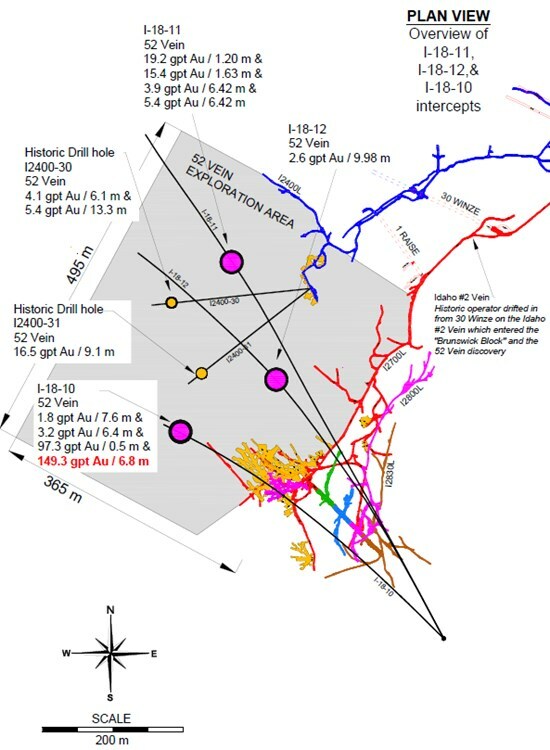 Important gold mineralization related to the 52 Vein was intersected in drill holes I-18-11 & I-18-12. The 52 Vein intercepts are located approximately 242 m and 125 m north-east of the previous drill intercept in drill hole I-18-10. A similar style of mineralization to I-18-10 was encountered with a wide flat lying shear vein and high-grade extensional veins in the walls of vein. Drill hole I-18-10 assayed 149.3 gpt gold over 6.8 m, including 2,190 gpt gold over 0.47 m and was previously reported by news release on Dec 13th 2018. The current drill program is focussed on the Idaho #1 Vein target and therefore the 52 Vein intercepts are incidental to the Idaho #1 Vein drilling. The 52 Vein represents a large and compelling target for a focussed drilling program in the future. A summary of drill hole assay results from recent exploration diamond drilling on the 52 Vein target are presented in Table 1 and illustrated in Figure 3. Richard Lippoth, M.Sc, CPG, the qualified person for the exploration drill results disclosure contained in this news release, has studied the drill core discussed in this news release and has reviewed the analytical and quality control results. Mr. Lippoth has reviewed and approved the scientific and technical contents of this news release. Benjamin Mossman, P.Eng, CEO of Rise Gold, is the qualified person for the historic production disclosure contained in this news release. Historic production at the Idaho-Maryland Mine is disclosed in the Technical Report on the Idaho-Maryland Project dated June 1st, 2017 and available on www.sedar.com. Rise has implemented a quality control program for its drill program to ensure best practice in the sampling and analysis of the drill core. This includes the insertion of blind blanks, duplicates and certified standards. HQ- and NQ-sized drill core is saw cut with half of the drill core sampled at intervals based on geological criteria including lithology, visual mineralization, and alteration. The remaining half of the core is stored on-site at the Company's warehouse in Grass Valley, California. Drill core samples are transported in sealed bags to ALS Minerals analytical assay lab in Reno, Nevada. All gold assays were obtained using a method of screen fire assaying. This procedure involves screening a large pulverized sample of up to 1 kg at 100 microns. Any +100 micron material remaining on the screen is retained and analyzed in its entirety by fire assay with gravimetric finish and reported as the Au (+) fraction result. The -100 micron fraction is homogenized and two sub-samples of 30-50 grams are analyzed by fire assay with AAS finish. If the grade of the material exceeds 10 gpt the sample is re-assayed using a gravimetric finish. The average of the two results is taken and reported as the Au (-) fraction result. All three values are used in calculating the combined gold content of the plus and minus fractions. Rise Gold is an exploration-stage mining company. The Company's principal asset is the historic past-producing Idaho-Maryland Gold Mine located in Nevada County, California, USA. The Idaho-Maryland Gold Mine is a past producing gold mine with total past production of 2,414,000 oz of gold at an average mill head grade of 17 gpt gold from 1866-1955. Historic production at the Idaho-Maryland Mine is disclosed in the Technical Report on the Idaho-Maryland Project dated June 1st, 2017 and available on www.sedar.com. Rise Gold is incorporated in Nevada, USA and maintains its head office in Vancouver, British Columbia, Canada. The CSE has not reviewed, approved or disapproved the contents of this news release. This press release contains certain forward-looking statements within the meaning of applicable securities laws. Forward-looking statements are frequently characterized by words such as "plan", "expect", "project", "intend", "believe", "anticipate", "estimate" and other similar words or statements that certain events or conditions "may" or "will" occur. Although the Company believes that the expectations reflected in the forward-looking statements are reasonable, there can be no assurance that such expectations will prove to be correct. Such forward-looking statements are subject to risks, uncertainties and assumptions related to certain factors including, without limitation, obtaining all necessary approvals, meeting expenditure and financing requirements, compliance with environmental regulations, title matters, operating hazards, metal prices, political and economic factors, competitive factors, general economic conditions, relationships with vendors and strategic partners, governmental regulation and supervision, seasonality, technological change, industry practices, and one-time events that may cause actual results, performance or developments to differ materially from those contained in the forward-looking statements. Accordingly, readers should not place undue reliance on forward-looking statements and information contained in this release. Rise undertakes no obligation to update forward-looking statements or information except as required by law.